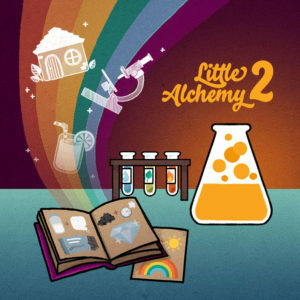 Little Alchemy is a chemistry-like game; its logic is based on the combination of elements to yield new elements. When a player starts the game, four elements are given to them. The player’s objective is to create all the elements in the game (over 700), starting with the four elements. These four elements are the Little Alchemy elements called basic elements or fundamental elements. When playing the Little Alchemy game, players will (from time to time) desire to create certain Alchemy elements. Unfortunately, players do not always know the exact element combination that will produce their desired element. To help the situation, we put up articles like this to feed players the information they need. This article is about element ‘Internet’. This element is a highly desired element, and we’ll discuss how to make it as well as other elements that can be synthesized with it. In addition, we’ll discuss parent elements of Internet. Internet is an element that can be made with as much three different combinations of Little Alchemy elements. There are three elements that can be used to synthesis Internet, and these elements are namely: Computer, Web and Wire. Computer is the most important parent of Internet. In fact, this element alone can be used to produce Internet. How can Computer alone produce Internet? All you have to do is to drag Computer from you elements list to the creation board. Afterwards, drag and drop Computer again from your elements list and drop it on the Computer element on the creation board. On dropping the second computer element, Internet will be yielded. Not only Computer + Computer combination is capable of yielding Internet, Computer + Web and Computer + Wire will also yield Internet. Internet is not a final element, and it can be combined with two other elements to yield two unique Alchemy elements. It can be combined with two IT related elements which are Dog and Letter. When Internet is combined with Dog, element Doge is yielded. The combination of Internet and Letter result in the synthesis of Email. The products of Internet are both final elements, they have no combinations and hence can not be used to create new elements. We have discussed how to create Internet as well as elements that can be yielded from it. However, there are players who do not have all or any of the parent elements of Internet. To help such people, we will briefly discuss how to make Computer, Web and Wire. Computer can be created from three unique combinations which are: Nerd + Electricity, Nerd + Tool and Nerd + Wire. Web is made by combining Spider with Thread. It can not be used to create any other element unlike Computer that can be used to create three elements apart from Internet. Wire is our last Internet parent, it can be created by combining Electricity and Metal.